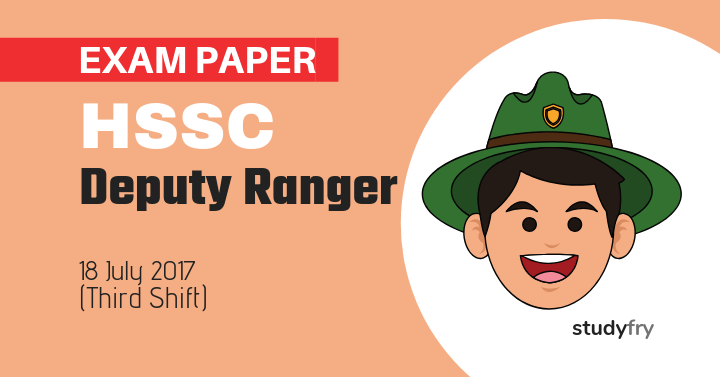 HSSC Deputy Ranger Solved Exam Paper – 2017 (Third Shift): HSSC Deputy Ranger at Forest Department, Haryana exam held on 18 July 2017 in three shifts, this is a third shift exam paper. This HSSC Deputy Ranger exam paper available in Hindi language. 2. निम्नलिखित में से कौन-सा बाँध हरियाणा में स्थित है? 7. The sentence given below contains one or more mistakes. Identify the correct sentence. A. Sahil preferably spend weekend in home. B. Sahil prefers to spend weekend at home. C. Sahil prefers to spend the weekend at home. 8. Complete the sentence by choosing the correct form of the verb given in brackets. Nexrt week, the tutor ______(begin) new lessons. 10. The antonym of “counterfiet” is_______. 11. 300 50 + 40 × 2 + 12 = ? 12. 3,600 रुपयों को तीन भागीदारों अरूण, शमिता और राजीव में इस प्रकार विभाजित कीजिए कि उनका हिस्सा 1/3 : 1/4 : 1/6 के अनुपात में हों। अरूण का हिस्सा क्या है? ACE : FHJ :: OQS : ? 36, 34, 30, 28, 24, ………. आगे कौन-सा अंक आना चाहिए?